Though Ivan would probably scoff to hear it, I really think he is the chairman of the board when it comes to nostalgia blogs. At Thrilling Days of Yesteryear, he crafts an astonishing number of posts, and they’re all so good. He is also the curator of Classic Chops, at the Large Association of Movie Blogs (LAMB), a service that is much needed, as we classic movie bloggers tend to get lost in that massive group of movie sites. In addition to all this, Ivan has the enviable talent to consistently write funny, and I mean “ha ha” funny. Thank you for agreeing to guest link Ivan! 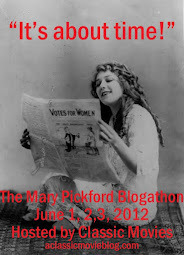 First…let me just say how thrilled I am to be the final guest “linker” here at K.C.’s blog. Second…that figurine was broke when I got here. Mill Creek Entertainment has inked a deal with Sony Home Video to release some of the older and newer product on DVD…among the classics will be Bonjour Tristesse, Ship of Fools, The Chase and The Last Detail. And with the May 13-18 For the Love of Film III Film Preservation almost along the corner, here’s a fun article from io9.com with a list of 24 Weird and Wonderful Movies That You’ll Never Get to See (and its sequel, 24 Weird and Wonderful Movies That You’ll Never Get to See II: Texas Blood Money). Ma Rainey (aka Gertrude Pridgett) (1886-1939), "Mother of the Blues"
Edgar Kennedy (1890-1948), king of the "slow burn"
Great choices Ivan. I'm still reeling from that amazing birthday list. Thanks for being my guest! There is nothing about that sentence I do not like. Great stuff, guy! And I totally got your back on this, man. That figurine was SO already broken like HOURS before we started throwing Nerf stuff around.